Boston University is currently engaged in Division 1 Certification with the National Collegiate Athletic Association, a process which occurs every 10 years. The University’s current review of our Athletics program began in the fall of 2008 with President Robert Brown’s appointment of Dean Linda Wells (College of General Studies) as the Chair of the Certification Steering Committee, and will culminate with the NCAA’s consideration of Boston University’s Division 1 Certification Self-Study Report during the late spring and summer of 2010 and an NCAA site visit to Boston University this September 2010. 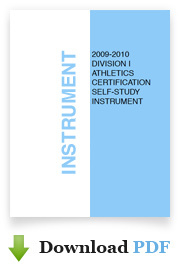 The centerpiece of the evaluation by the NCAA and for long-range planning for the future of athletics at Boston University is the self-study document which incorporates current as well as historical data and a comprehensive evaluation of the current state of Athletics at BU and action plans for the future. The completed Self-Study will be sent to the NCAA on May 1. Before the Self-Study Report can be considered complete and sent to the NCAA, the review and comment by those most affected by the quality and integrity of Athletics at Boston University — our students, faculty, staff, alumni, and Board of Trustees – are needed. The Steering Committee invites you to read and study the draft Report and to respond with your comments and suggestions over the next two weeks. Each response will be sent directly to the Steering Committee for consideration if received by April 20, 2010.